So, I finally got my hands on OneNote Notebook creator as part of the trial group at my school, thanks to the support from the computer team who’v set it up. They set the Sharepoint site up and I ran the Notebook creator tool, setting up three distinct spaces in the OneNote notebook as outlined below. I set up the student private notebooks with tabs for the key texts (Amadeus, Antony and Cleopatra etc…) a content library, which is the resources I’ve been sharing so far by email, and the collaborative space,which I’m probably most excited about. A private notebook shared between the teacher and each individual student. A read-only notebook where teachers can share handouts with students. Students can only read — i.e. pull from — the Content Library. They cannot edit. A notebook for everyone in your class to share, organize, and collaborate. I’ve been using OneNote as a teaching tool for years now, and this is the biggest break-through yet I think. As one teacher, from the USA, I was speaking to yesterday said, this is a ‘game changer’. I written a few times over the last couple of years about the Getting Things Done system as developed by David Allen. It’s a great system for sorting out the multitude of ‘stuff’ that comes into your life, from emails to the shopping lists. Along with the GTD system I’ve been tinkering for a while with the best software to support GTD. 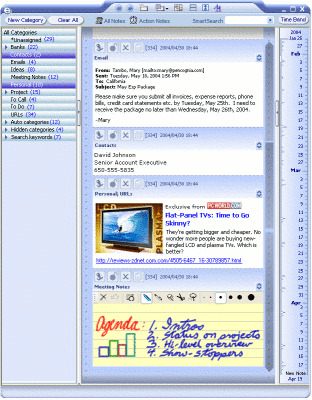 I’ve tried using add-ons to Outlook, like the Jello Dashboard and last year moved to Thinking Rock, an Australian software tool based around GTD. This year I’m trying GTD-Free, a free and open source piece of software that looks plain, but promising. I’ll let you know hot it goes. Meanwhile, as schools begins to warm up and wind up I heartily recommend the GTD system for teachers. I thought I’d end the year not with anything deeply philosophical, but with that thing all bloggers love: a list! In this case, a list of my favourite software finds for 2008, for your downloading enjoyment. Happy New Year everyone. All the software in this list is free or open source. Evernote upped the ante this year with a completely new version that sits on your computer, or phone or pda and syncs effortlessly with the web. Consider it a giant endless roll of notepaper that you can categorise, tag and search to your heart’s content. Ideal for capturing the setup instructions for your modem, that list of Christmas presents you were meant to buy, screenshots or anything. I have notebooks of recipes, travel ideas, cycling news and lifehacks, but invent your own. Only for GTD geeks, this Australian based software uses the ‘Getting Things Done’ system to help create workflows from idea collection, to managing multiple projects. The best GTD software I’ve seen yet. We all know Windows Explorer is no way to manoeuver around files and folders so it must be replaced! For a while this year I used Free Commander and a very nice tool it is. But Nexus File Manager, besides looking all black and green and retro, is a powerful file manage software that can do a host of functions from multiple renaming to moving, pasting, copying, including dual window panes. And it’s all pretty much driven by keyboard shortcuts. So, put the mouse away and never open Windows Explorer again. This converts most media to other media types; simply and quickly. The other day I wanted to extract some audio from a youtube video and this did it with ease. In Australia broadband accounts are generally capped, usuallyon a monthly basis, with plans like this. 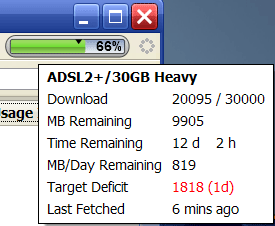 So, to survive this heinous situation I found a Firefox Extension which keeps a tab on yur broadband usage, literally. It sits in the menu bar and gives a percentage figure on how the allocated amount is going.